At first I noticed Andrew for some brilliant posts about Google Shopping campaigns, like for instance this one: https://savvyrevenue.com/blog/google-shopping-campaign-structure/ posted on his own agency’s blog. Then I realized I had found a top PPC professional with first class experience, who co-founded White Shark Media (a quite renowned global SEM Agency). I contacted him almost immediately and received a very good feedback about his skills and professionalism. Here is his own auto-presentation. My name is Andrew Lolk, and I’m the founder and Lead PPC Manager in SavvyRevenue. I’ve worked in PPC since 2009, and have been an agency owner since 2010, but started my new agency in early 2017. I previously co-founded White Shark Media, a 7-figure PPC agency that have been on the Inc 5000 four times in a row. Today, my entire focus is on the bigger advertisers in ecommerce. At SavvyRevenue, we exclusively focus on helping medium to large eCommerce stores grow using Paid Search. We have a team in Scandinavia and one in the US. When I asked Andrew what he would have liked to speak about at ADworld Experience he answered that one of the main reasons why advertisers don’t grow is that they pause too many things too fast. Instead, in my presentation I will explain our philosophy that will help you look at your data in a more segmented fashion and help you grow your account. There’s more to AdWords bidding and performance management than the data you’re seeing. Knowledge to why you haven’t been able to grow your account in the past is hidden in several areas to review before pausing keywords/ads or decreasing bids. It’s hard to predict what will affect Shopping campaigns during 2018. I think the most influential areas are a couple of years out. The biggest things are AI, machine learning and voice search are really not ready to make a big dent in anything yet. What websites and people influence you? In 2017 I highly enjoyed Crealytics’ writing on Google Shopping, which has helped solidify some of our strategies in SavvyRevenue. On a daily basis, I honestly don’t read much within Search. I feel you can quickly get caught in the onslaught of bright and shiny objects. How was 2017 for you? What are your plans for 2018? 2017 was the year where I got back in the trenches and started my new agency. It was a great year and we hit every single target that we had set for ourselves. Our plans for 2018 is to establish strong, strategic partnerships with other like-minded agencies, so we can provide our clients with a Cross Channel Ecommerce marketing program that involves Search, Social and Email. However, we will do it by partnering up with two other agencies that are highly skilled in their individual fields. 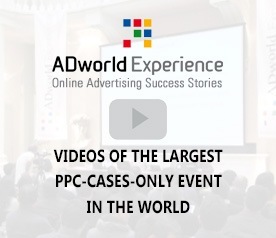 For ADworld Experience Andrew will hold a 1.5h advanced seminar about Shopping campaigns on April 12 and will show a real Optimization case on the 13th.